WinBin2Iso converts CD and DVD disk images from BIN to ISO format, including files over 2GB. As many more tools support ISO over BIN images, this can save time and energy. How to extract: Download the "Portable" ZIP package and extract to a folder of your choice. Launch WinBin2Iso_p.exe(ANSI), WinBin2Iso_uc_p.exe(Unicode) or WinBin2Iso_x64_p.exe. DSpeech is a text-to-speech program with the option of saving the output to a variety of formats, great for creating audio books from text sources. It also supports dynamically changing the features of the voices e.g. insert pauses, emphasize specific words, spell them out etc. using tags. The program works out-of-the-box on WinXP and above, using the included Microsoft speech engine SAPI5. For WinNT/2K, you will need to install the speech engine separately. You will find links to plugins, speech engines and voice sets on the program website. The program can import text from TXT, DOC, DOCX, RTF, HTML, XML and PDF and output to MP3, OGG, AAC, WMA, OPUS and AMR. How to extract: Download the ZIP package and extract to a folder of your choice. Launch DSpeech.exe. Optionally, delete unnecessary language and manual files. I tried to test DSpeech but it failed to run on my system (Windows 8.1)- what are its requirements? DSpeech is now version 1.63.3 Released 2017 Mar 27 at Authors site. 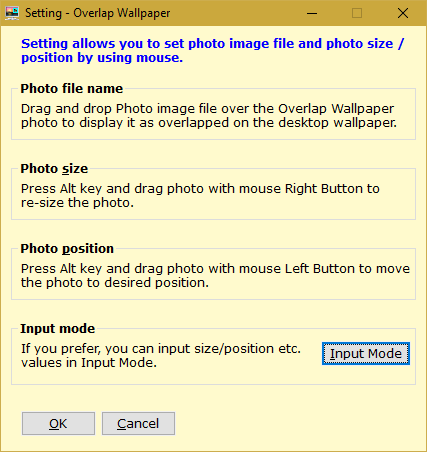 Overlap Wallpaper displays a photo on the desktop wallpaper so that one can have for example the photo of a loved one on different wallpaper image. The overlapped photo can be sized, positioned on desktop as required, and made semi-transparent. PNG image photos with transparent colors are supported. Photos can be reloaded after a set time, allowing for example the use of another program to overwrite previous image file and auto-display it. How to extract: Download the ZIP package and extract to a folder of your choice. Launch Overlap Wallpaper.exe. Fully support alpha channel PNG. Drag and drop image file to set photo. Alt+Left mouse drag the photo to new position. Alt+Right mouse drag the photo to increase / decrease photo size. Input Mode to position / size values in settings like previous versions. Fixed: "hide tray icon" in ini file not working. With the settings below this acts like a wallpaper changer, though you will lose desktop icons while running in this way. Couldn't the author just name it correctly? Its just a desktop picture gadget, a poor one. OW has few different features than widget, so a different name. It works in Xp which do not have widget support, and also Win8. You are welcome to read features and feedback at the website (https://sites.google.com/site/overlapwallpaper/home) for more information. I will request you to use OW along with widget to get first hand experience. OfflineRegistryFinder allows you to scan registry files from a separate source (not your local system registry) or registry snapshot to find keys/values/data. After it displays the search result, you can easily select one or more items and then export them into a .reg file. This can then be imported into the RegEdit tool of Windows. Note that snapshot searches may be faster than a live system, especially for repeated searches or general research. As such, creating a snapshot of your current system and using this program may work better and faster than other registry search tools. How to extract: Download the ZIP package and extract to a folder of your choice. Launch OfflineRegistryFinder.exe. Fixed bug: OfflineRegistryFinder failed to search properly large Registry values with more than 16344 bytes. qBittorrent is a file sharing client modeled as an open alternative to µTorrent. It includes a torrent search engine, support for all extensions (DHT, Peer Exchange, crypto, Magnet/BitComet etc. ), web interface, RSS, scheduler, IP Filtering (eMule and PeerGuardian compatible), IPv6 compliance and more. Uniquely, it includes a program lock to password-protect the interface. The program includes torrent creation and even tracker capabilities (for serving content). qBittorrent Portable is PortableApps.com version of the program. Alternatively, X-qBittorrent is also available. Clients are also available for other platforms (Mac, Linux, FreeBSD, OS/2) and in ~25 world languages. How to extract: Download the self-extracting EXE to a folder of your choice. Launch qBittorrentPortable.exe. It now supports --portable parameter.